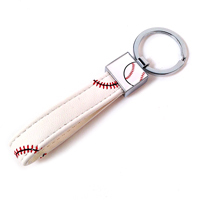 You live and breathe baseball - Wear your "heart" for the game! 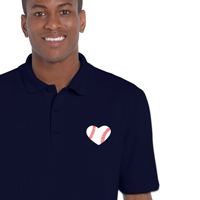 The Baseball Heart Polo Lady's Fit shirt features a white heart with red baseball lace design on the upper-left chest. The right sleeve contains the Sports Roses slogan "Your Passion...Expressed". 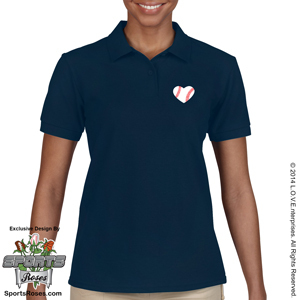 Polo-style shirt is 50% cotton / 50% dryblend polyester preshrunk pique knit with 2 color-matching buttons. A soft and durable shirt with moisture wicking fabric. Side-seamed with tapered feminine fit. All shirts are printed after your order is placed based on the color you choose. Please allow 3 business days for your shirt to be created before it ships. 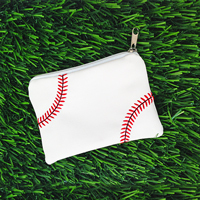 The rose with petals handmade from genuine "baseball leather" - Blooms forever!